I have a second Born Pretty Store product review today. I got a 12 pack of glitters from them to try out. I started with a cheap yellow polish just to have something to stick the glitters to; sprinkled the yellow glitter on top of that, then let it dry, applied a thin coat of clear polish and another sprinkling of glitter. On top of the glitter, I used China Glaze Thistle do Nicely for some neon pink leopard spots. The glitters are very fine and are actually meant to be mixed with acrylic powder, but this is another way, the way I chose, to use them in nail art instead. All 12 of the colors I got are gorgeous (pictured below)! The yellow didn't end up being quite as sparkly on the nail after I applied topcoat as in the jar, but it was still really pretty and added a little something extra to the animal print. 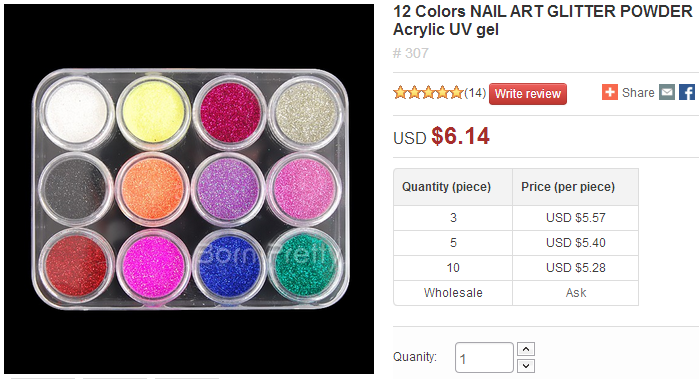 This pack of glitters comes in a clear plastic box, with each glitter in its own small twist-lid pot, for $6.14 USD. 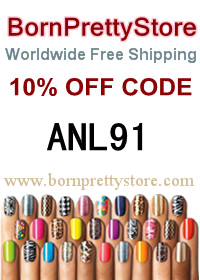 I also have a coupon code for 10% off regular priced items: ANL91.